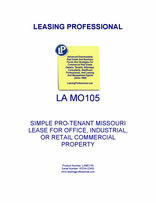 This form is for a single tenant Missouri lease where the tenant has superior leverage. It gives the tenant the right to use the premises for "any legal use," and has very abbreviated remedies for the landlord in the event of a tenant default. It is also pro-tenant in character because of the clauses it does not contain which customarily appear in pro-landlord forms relating to remedies and a variety of other pro-landlord provisions. Missouri (specifically Saint Louis) became part of the United States as a result of the Louisiana purchase, and has long been known as the Gateway to the West. Missouri's present day economy is very diverse. Many jobs find their roots in the service industry, while others come from tourism and travel.